The 20,000 square foot multi-venue studio space Clickspring Design created for MBC (Middle East Broadcasting Center Group) mixes classical architectural influences combined with fresh, light and modern materials — the result is a stunning look that plays homage to the network’s home country of Dubai while still creating a streamlined and high-tech look befitting a 21st century broadcaster. For its design inspiration, the Clickspring team looked to two classic concepts found in Islamic art and architecture — tessellation and subtractive forms. Aperiodic tessellation, a concept first developed by the Sumerians in 4,000 B.C., and commonly found in Islamic tile work, provided the base for the set’s geometric shapes. By taking layers of equally spaced grids and rotating them on top of each other, a dizzying array of shapes and patterns emerge, including triangles, multi-point stars and triangles and even curved forms. These forms can be found throughout Islamic buildings — and serve as the foundation for the MBC set’s design. 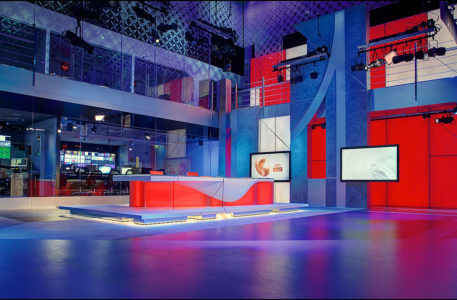 The set’s backlit walls, for example, feature an “X” shape pattern that is then repeated — with a twist — in the glass panels surrounding the upper levels of the main studio space. On these panels, the “X” shape gracefully morphs into geometric “petals,” creating a dynamic pattern that draws the eye upward, pays tribute to Islamic art and also adds texture and layers to the large space. The notion of the morphing shape is inspired directly by tessellation — since, as one rotates one or more of the grid layers, the shapes and patterns form, meld and disappear. In addition to tessellation, the studio’s strong vertical lines and forms mirror the city of Dubai’s always changing skyline of skyscrapers while also playing homage to the city’s older minarets. 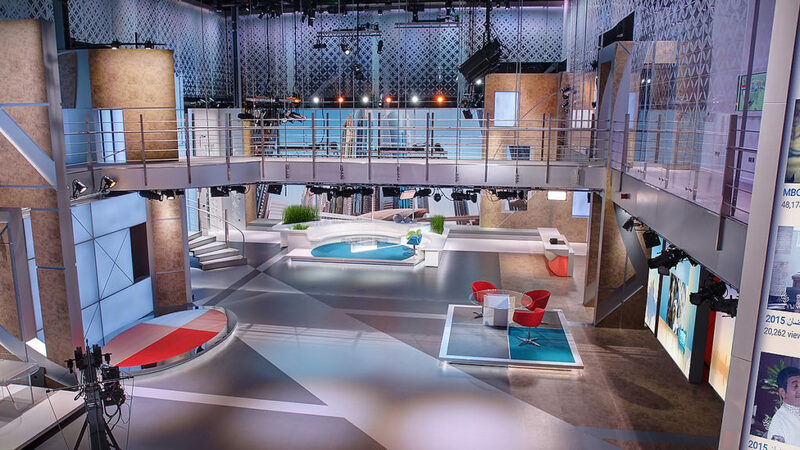 The large, open central space soars to three stories tall and boasts a control room-backed news area with modular desk that can be arranged in a variety of configurations. The lighting was handled by The Lighting Design Group with fabrication handled by a local firm and AV integration done in-house. 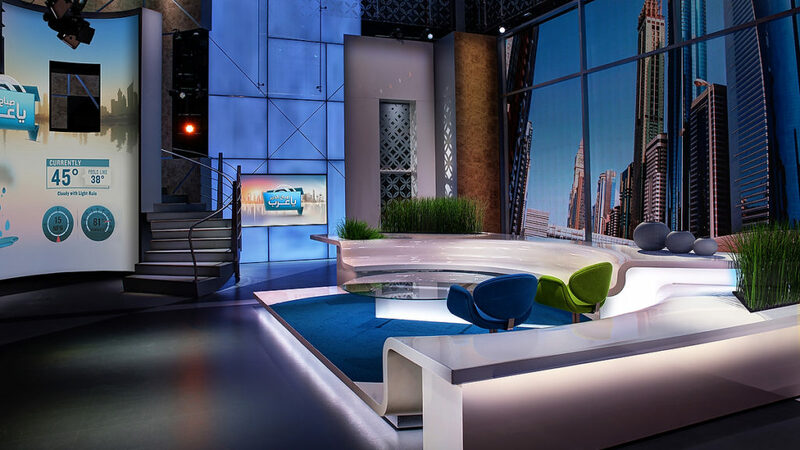 For the show’s morning programming, a large LED video wall creates the look of broad windows overlooking Dubai, while a curved integrated seating area provides flexible seating configurations. Tucked under a neighboring balcony is a demonstration kitchen, while a gracefully curved staircase wraps around a two-story curved concave LED panel with a window-like opening in the upper portion. Subtractive forms, like this opening in the stairway video wall, is a concept that involves strategically removing portions or blocks of solid shapes to create segmentation and flow, is integrated throughout the space, including small openings breaking up the textured walls, creating numerous niches and openings in the set’s various surfaces. Subtractive forms are also found in Islamic buildings, street layouts and art. The dramatic stairway leads to the upper portion of the main studio, a mezzanine level with a wraparound balcony flanked with frosted glass panels and workspaces, while a dramatic catwalk runs across the center of the studio. Meanwhile, tessellation finds its way into another of the set’s centerpieces — a multistory, eight point star shaped social media tower, as well as the diagonal lines found on the floors and curved archways. All of these shapes and lines can be found in “hiding” with a tessellation grid form. The social media tower’s strategic placement and shape allows it to be used by the main studio space, adjacent sports set and a second level space designed for children’s programming. 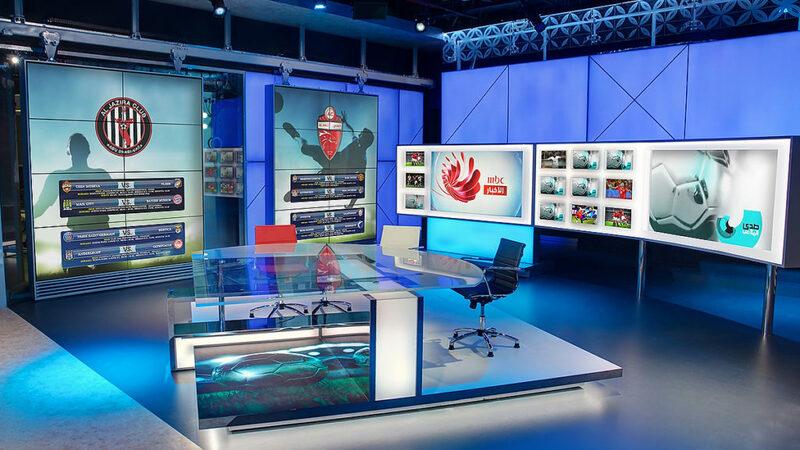 The first level sports set features a dividing wall created from a combination of glass, backlit walls and sliding video panels. 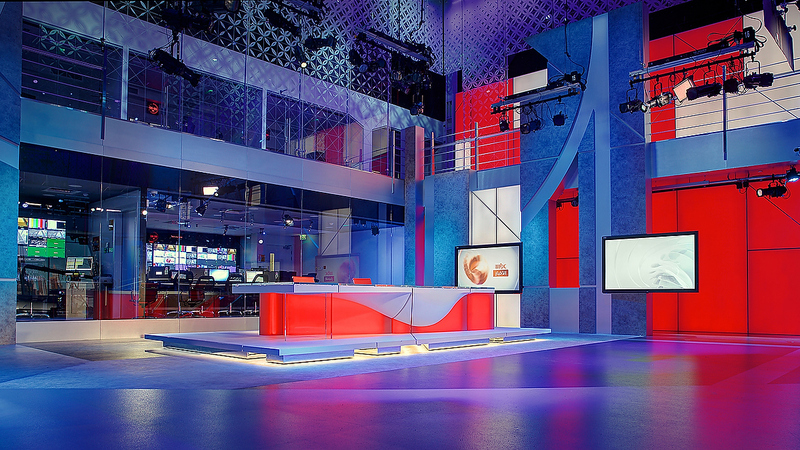 Subtractive forms make another appearance here — this time in the anchor desk which can be used for a variety of talent configurations and take advantage of the space’s sliding video panels with industrial mounting hardware and curved backlit and multisegment LED wall. 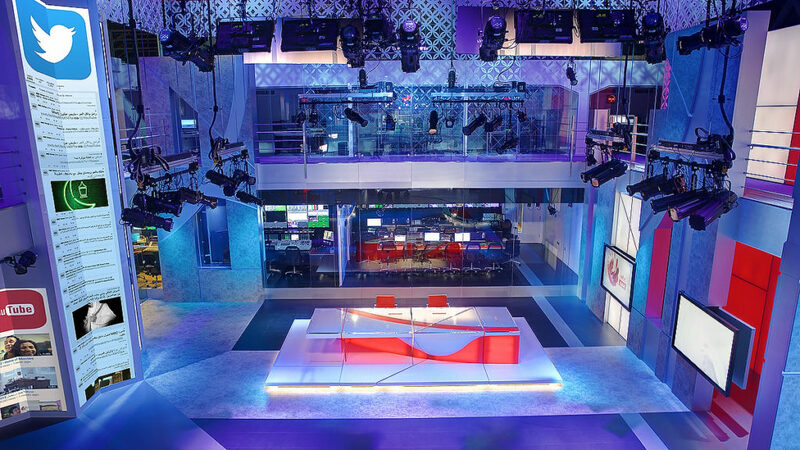 All of the MBC spaces expertly blend clean metal finishes, color-changing backlit surfaces, layers of glass and even organic sand-colored textures to create a design that mixes the old traditions of Islamic architecture with the look, feel and needs of a modern broadcasting facility reaching a 21st century audience.